A darkly comic picaresque wide a wide cast of characters, set in rural Ohio in 1917, focusing on three sharecropper brothers turned outlaws, and a well-meaning farmer and his wife. 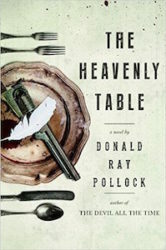 With The Heavenly Table, Pollock returns with another deranged, blood-soaked tale, but because of its technical prowess and contemplation of weighty ideas, it’s his best work yet ... Part Western, part folk tale, part Southern Gothic, The Heavenly Table is all Pollock — scatological, brutal, and bawdy ... The author pulls back from the outright exploitation of characters. Shot through the cracks of their general debasement and idiocy is their humanity ... A striking technical aspect is the thumbnail biography Pollock offers every character. ...[a] wild, rollicking and wonderfully vulgar novel ... it is distinctly refreshing to read contemporary American fiction that concerns itself with such a fundamental problem of existence, far beyond the closed loops of affluent friends cloistered in the same old corners of urban America ... Pollock has set himself the task of working within the constraints of genre, but because he’s such a smart and funny writer, he’s incapable of delivering an empty entertainment ... Yes, The Heavenly Table is an old-­fashioned yarn with a pretty predictable plot — but that’s the point, and as with The Adventures of Huckleberry Finn, it is also a riotous satire that takes on our hopeless faith in modernity, along with our endless capacity for cruelty and absurd pretension ... Pollock grants each of his many characters, no matter how minor or ­wretched, a story and a soul. Pollock's characters all live in the slipstream of this onrushing future, their lives upended by engines and automation, milking machines, telegraphs and a great war that they don't understand. The result is a story that reads almost like surrealism — like weird fiction save for the certain fact that all of it is real. In its bloody, violent, terrible collisions, The Heavenly Table feels like Blood Meridian if Cormac McCarthy had been born with a streak of black humor in him rather than just terseness and rage. What did you think of The Heavenly Table?